Airbus is downplaying test results in which an A380 wing undergoing static testing failed slightly before the required design limit. The wings are supposed to take 1.5 times the design load limit but this one failed at 1.45 times, about 3.3 percent shy of the certification requirement. Airbus spokeswoman Barbara Kracht said the wing will need some “refinements” but the aircraft is on schedule for certification and first deliveries late this year. “We will need to find out from the data what is really needed but it’s certainly not a redesign of the wing,” Kracht told Associated Press. In order for an aircraft to be certified here in the U.S., it must withstand the maximum “g” loading specified for that category, plus a 50% overload factor. For example, in the Normal category, the aircraft must withstand a positive load of 3.8g and a negative load of -1.52g at maximum gross weight. It must also be able to withstand an additional 50% of those loads without failing. These “static” tests, as they’re called, are accomplished on the ground by mechanically loading up the wings. Sometimes this is done by simply placing sandbags on the wings to simulate a load. Large manufacturers like Boeing and Airbus use slightly more expensive methods. I’ve seen video of a 777 wing being tested to failure — the wings bent up to the point where they almost touched. In other words, it handled far more than the required loading. (b) The positive limit maneuvering load factor n for any speed up to Vn may not be less than 2.1+24,000/ (W +10,000) except that n may not be less than 2.5 and need not be greater than 3.8 — where W is the design maximum takeoff weight. (2) Must vary linearly with speed from the value at VC to zero at VD. (d) Maneuvering load factors lower than those specified in this section may be used if the airplane has design features that make it impossible to exceed these values in flight. So if the plane is going to be certified in the Transport category, it will have to handle somewhere between 2.5 and 3.8 positive G — plus 50% — depending on the maximum takeoff weight. I’ve never heard of an aircraft failing to withstand the 1.5x test. That’s not to say it’s never happened, just that I’m not familar with such an ocurrance. However you slice it, this has got to be a huge embarrassment for Airbus. Even if the flaw was simply a construction defect in the prototype, it will bring into question every other aspect of the A380’s design and construction in the minds of potential customers, not to mention the flying public. It’s a bona fide public relations disaster. I expect Boeing will get major mileage out of this one, though if they’re smart they will tread carefully. After all, Boeing will soon be seeking certification of its own new design, the 787 Dreamliner, and Airbus’ PR folks will certainly be looking to return the favor. 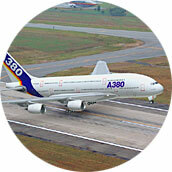 I’m curious what progress has been made on the A380’s weight problem. I heard a while back that the empty weight was greater than planned and the engineers were looking for ways to help the plane lose a few pounds. The new kid in town has a weight problem, eh? Plus he can’t fit through the door (jet) -way in most places. Brittle bones (not enough vitamin D? ), too. The airplane is starting to remind me of that chubby, chocolate-loving German exchange student on “The Simpsons”. Maybe Airbus should check with Boeing. They keep extending the 737 fuselage on that thing, making it longer and longer. You’d think eventually they’d have to re-engineer the whole plane to deal with the extra weight. Or was the original 737 just that overbuilt? Well, they were close enough that it is quite likely they will be able to pass the test by analysis rather than full blown retest involving another wing. Interestingly, I remember reading somewhere that the 737 failed this test during certification. Supposedly the initial design broke before 100 percent of ultimate…..oops. The C-17 (Boeing product) wing failed static testing twice. The 737-NG (600-700-800-900) has a different wing than the classic, and the type certificate was updated to reflect this IIRC. The wing is seriously different, 25 percent more area. You don’t just add a hundred passengers and a thousand miles of range without making dramatic changes to the airframe. OK, this is a pretty incoherent site. where are all these videos you talk about. I can’t find them so if they are really here, then they need to be placed in a conspicuous spot. Every Airbus pilot I’ve ever heard give an opinion on any of the Busses had absolutely nothing positive to say about them.